My name is Flat Stanley, I have been spending time at Sarah's house during the Thanksgiving weekend. Here I am sitting with Sophie and Sydni while we watch Kung Fu Panda. Sarah is making the popcorn while her husband is taking this picture. I am having a great time! The girls are so nice to me, after they heard the story of why I am flat they have decided to show me a great time. Here I am getting ready to go see the lighting of the Santa in downtown Fort Wayne. That will be fun but I wish that whoever made me would have made me a coat too. It is freezing here! Tomorrow I am going on a hike at Sarah's grandma's house. I know that will be a lot of fun. There is a lot to do here during the weekend. On Friday I got up real early to go Christmas shopping with Scott and Sarah. I know what the girls are getting for Christmas! On Saturday, last night, I went to the Festival of the Trees. Sarah and Mrs. Barney went there and the trees were beautiful. We keep very busy! I will be glad to be back at school on Monday, it will be a good rest for one tired Stanely! So I heard this phrase this week: "This writer's Workshop thing seems like a lot of fluff..."
Makes the hair on the back of your neck stand up doesn't it? Me too! I pondered this statement a little further. I want my workshop to be fluffy. Any time I have ever read a book, or article that has touched me in some way I can imagine that it has been written with a certain flair of fluff. Any time I have every read something that has changed my life whether it be professionally or personally it has been surrounded by "fluff." Touching quotes that make me think, personal stories that make me weep, and differing ideals that make me stand up against the flow, these are the things that may be considered "fluff." As I teach writer's workshop each day with my students I want them to believe that their "fluff," is real. Their words matter, what they have to say on a daily basis is important to me, and if that means I have to create an environment that others would consider too "fluffy" then so be it. This is my most important task, creating a world for children in which they believe that their words are worth putting down on paper. A world of fluff. Recently, Stenhouse Publishers, sent me a book to review for them. I was so excited to receive Beyond Leveled Books by Karen Szymusiak, Franki Sibberson, and Lisa Koch. But to review this book in one post will be impossible. After reading the forward, the list of mini lessons, and the first chapter I knew that I had much to gain from this book. Franki Sibberson, if you don't know is a co-blogger. Her blog, A Year of Reading, is a great place to land when you are looking for that perfect book. I have found myself browsing over there several times in the past. She and Mary Lee have much to offer to us in the teaching world. Beyond Leveled Books draws you in during the first chapter as they persuade you to move away from the bookroom, away from the prepublished books from your basal, and to really evaluate the books you are placing in the hands of your children. Chapter two begins by showing us that there is a place for leveled books, it is beside the real books. These books, in baskets are arranged with in our classrooms for students to pick from. Chapter 2 has an extensive list of authors that k-1 students can choose as "just right" texts for independent reading. This book list would be great for teachers who are just beginning to understand what Reader's Workshop is all about, and how to select and set up their classroom library. However, where my learning occurred was through the rest of the book. These authors have shown me how to move my first grade readers into that transitional territory and then into independence. The authors discuss the importance for these transitional readers to choose books within a series. (Henry and Mudge, Mr. Putter and Tabby, The Magic Treehouse, etc.) When readers choose series books they can rely on the characters to carry them through the new material. They learn to rely on these sections of the book, they come to trust the author and even struggling readers can use their comprehension strategies because of the "known." Again, there is another extensive list of series books, picture and chapter, that a teacher could use to select and use within their classroom. "In a time of test scores and accountability, teachers are being forced to spend precious classroom time in ways that do not necessarily foster lifelong reading. We worry that in the name of accountability we are increasingly pressed to find time for the things we know our transitional readers need." Amen sisters! This book keeps me from searching for those things that my students need, it is within this book. I am anxious to use the mini lessons, and strategies suggested in this book. I can more explicitly teach in my crunch of time. Thank you for showing me the important "stuff." Ways to take learning home for your students, there are lots of ways to encourage your families in their discussions about books. Go get this book, it is phenomenal!!!!! 1. She writes small moment stories-all of her stories could happen at school. 2. She uses comeback phrases. 3. She loves the seasons and creates imaginary characters out of the months. 4. She grows her story problem- it gets bigger and bigger like a mountain. And, then there is a solution. 5. She uses the dash, a lot. She also likes the exclamation mark and the elipses. 6. She uses letters to show how the character is feeling or the loudness of the voice. Gets bigger when their voice gets louder, and smaller when they are whispering. 8. The text on the page is placed weirdly on the page. I'm not sure if this is an editor thing or author sort of thing? Any ideas? 9. She loves sound words. So today, I went a different direction, I went with the magical way she uses word groupings. We are going to do a few short practices together and then I'm going to have them have a go with it. It is so cool to see their growth from last year. They really get the idea of using an author to mentor them. Today I have the day off of school. I am remembering the sacrifices that these brave men and women face everyday. I thank them for their sacrifice. 1.6 million soldiers are currently deployed to other areas of the world. Whether you believe in the politics behind the deployments you must always support their sacrifice. Husbands, mothers, sisters, wives, dads, brothers, sons, and daughters currently serving our country for my freedom and yours. Using Lynn Plourde as our mentor! Last week, every day of the week, my students were greeted with a wrapped gift sitting on the chalk rail. Every morning they came in excited to see who would unwrap the gift, what the title of the book would be, and who would be the newest character we would be introduced to? My students were very excited, I had learned of this author when I had coffee with a friend at Starbucks. Cathy, from becoming, had mentioned these books as being perfect for study an author as a mentor. She was right! After we opened four of the books, on Thursday, I sent home a secret letter with each child. Inside was an invitation to wear their jammies to school on Friday. I mentioned that it was in honor of our last Lynn Plourde book. Friday morning dawned and I arrived at school and hoped they were as thrilled about being in their jammies as I was. We hugged and giggled about each other's jammies. We talked about our adorable slippers, and then during our morning meeting we read the last of our series. It was a celebration that I didn't expect. We became one again as a community, we again enjoyed books, and we are anticipating this week's mentor lessons. During writer's workshop we didn't even discuss the literary elements of Lynn Plourde's work. We discussed our own literary elements, things we have discovered about one another. I have a student who has been mimicking Kate DiCamillo in his own work because we have been reading The Tale of Desperaux. I used Lester Laminack as a mentor in one of my pieces and I wanted my students to see my end result. We also read Peter Reynolds' book The Dot. We noticed things about using books as our mentors. 3. Words placed weirdly on the page and in different colors. I have two people I know this will impress! What can I learn from this that I might try in my writing? 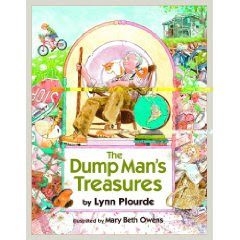 Caption: This is a beautiful book about a dump man who takes care of the town dump. He refuses to throw away books. He lends then out, gives them away, but all must promise not to throw them away. Through the storyline we discover that he himself can not read! Imagine, a person who can not read cherishing books so much, a lesson for early readers! I took these photos recently of the girls. They are both oblivious to the fact that I am taking their pictue at these times. Recently, I have been reflecting on my life with them. It seems that eight years ago my life changed and now my two treasures are walking around in this giant world, unprotected. I question what I did before they were here walking this earth? "I want you to be a stay at home mommy like my friends." As I look at these photos of them, oblivious, I see contentment. Their childhoods are more than most people can ask for, or have ever had. My students were to draw connections that they made with the sounds, images that popped into their heads as they listened. Each sound was short, even played several times, but colored pencils were working themselves into a frenzy. When the sounds were finished, we gathered together on the rug and shared our picures with a partner. We discussed what each sound brought forth into our minds, the discussion was amazing. What we really discovered was how different our schema is, we have all been to some amazing places in our lives. Images are everywhere! Tomorrow, When I was Young in the Mountains by Cynthia Rylant. I am going to read it and reference my images as I read, modeling the appropriate language. Already though, I can see the creative images flowing.